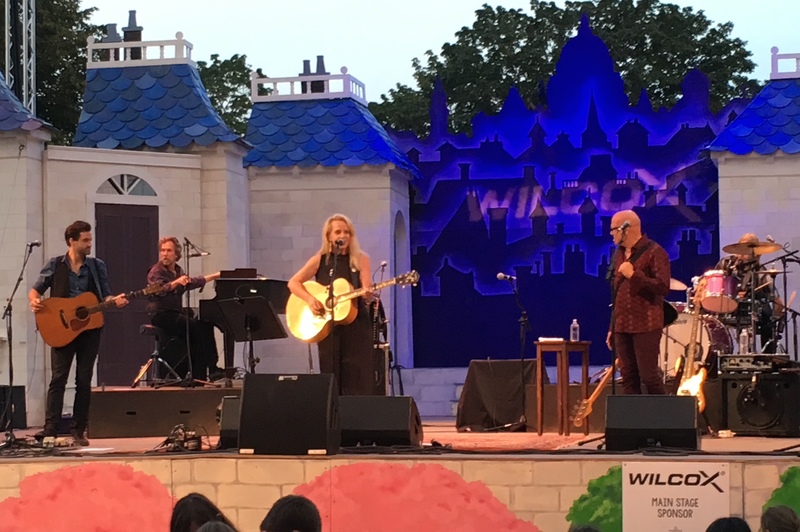 Songwriter, singer & guitarist Mary Chapin Carpenter has performed at the Prescott Park Arts Festival in Portsmouth, New Hampshire, three times over the past five summers. She shared the stage with singer/songwriter Marc Cohn on Wednesday, July 24, 2013 and did an “acoustic” show accompanied by pianist Jon Carroll and electric guitarist Duke Levine on Saturday, July 12, 2014. Most recently, on Thursday, August 3, 2017, Ms. Carpenter rocked the Prescott Park stage backed by an excellent 4-piece band. Here’s a photo my wife took at the 2017 show. My wife and I thoroughly enjoyed each of these musically magical events: the extraordinarily well-crafted songs; the flawless, intricately detailed singing and playing of truly gifted musicians; and the enveloping-yet-crystal-clear sound reinforcement. Set in the gorgeous outdoor waterfront venue of Prescott Park, each evening was also blessed with the kind of perfect summer weather that one can only find in southeast New Hampshire. The most memorable evening of them all for me was the acoustic show on July 12, 2014. Of the three, this concert seemed to be more about Ms. Carpenter’s songs. But then there was the moment, about midway through her set, when Ms. Carpenter put down her acoustic guitar, Mr. Levine left the stage and Mr. Carroll cast a sparkling handful of notes from his grand piano out into the warm evening air. This is the song that followed. That was again Jon Carroll accompanying Ms. Carpenter’s vocals. “Only A Dream” is from Mary Chapin Carpenter’s fourth album, Come On, Come On. That 12-song collection was recorded at Bias Studios in Springfield, Virginia and released by Columbia Records on June 30, 1992. “Only A Dream” was released on December 6, 1993 as the B-side of the single featuring “He Thinks He’ll Keep Her.” This was the sixth of seven singles released from Come On, Come On. Two tracks from Come On, Come On won Grammy Awards. “Passionate Kisses” was voted Best Country Song with the Grammy going to its author Lucinda Williams and “I Feel Lucky” earned Ms. Carpenter the award for Best Female Vocal Country Performance. Mary Chapin Carpenter was born on February 21, 1958, in Princeton, New Jersey. She is the daughter of Mary Bowie Robertson and Chapin Carpenter, Jr.
She recorded and released her first album, Hometown Girl, in 1987. Her next and 15th album, Sometimes Just The Sky, is scheduled for release on March 30, 2018. Happy Birthday, Mary Chapin Carpenter! This entry was posted in Posts with Video, This Historic Day In Music and tagged Bias Studios, Come On Come On, Duke Levine, Jon Carroll, Marc Cohn, Mary Chapin Carpenter, Only A Dream, Portsmouth NH, Prescott Park Arts Festival. Bookmark the permalink. The 2017 performance at Prescott Park wins my own first prize. Her obvious enjoyment and connection with the audience was electric. I couldn’t take my eyes off of her. The lyrics to her new(er) songs were as fresh and relevant as ever. Music…wow! She shared personal memories and stories (one involving Eudora Welty!) to give us a glimpse into her writing and creative process. As a non-musician I still could appreciate the obvious quality of her performance and her band’s performance as well. They were like clockwork and didn’t miss a beat or a note. Amazing. Days later, I bought my first CD in years: Carpenter’s “The Things That We Are Made Of.” It is – as one online editor describes it – “…a set of gorgeous Americana tracks that serve as a memoir.” MCC totally nails it…the whole album – but especially the first 2 tracks. One last thing – I absolutely love it that a woman who just turned 60 is still rocking on. Yes, Happy Birthday!! !